If you replace your forced-air furnace with a new electrical furnace, you can usually use the existing ductwork with very few modifications. However, if the energy efficiency of a house is improved, it will have a smaller heating need than it had before the retrofit. This could mean that the furnace is now oversized. If so, you might end up with large temperature fluctuations and the potential for rapid on-off cycling. A pump to circulate water from the boiler through the pipes to the radiator and back again. The boiler is a compact electric hot water heating system. Its heating elements are immersed directly in the water (as in an electric kettle). Where space is limited, the boiler can be installed on a basement wall, in a closet or in a garage. Dual-energy systems with a heat pump have special features. The right-sized heat pump can generally provide comfortable heat without the aid of another energy source until its balance point temperature is reached. Here is how a dual-energy system with an air-air heat pump normally operates. When the outdoor temperature falls below the switchover temperature, the heat pump stops operating and the auxiliary energy source takes over all heating. Note: A heat pump doesn’t affect the way the dual-register meter works. The switchover temperature is still −12°C (or −15°C), even if the heat pump requires assistance before that temperature is reached. 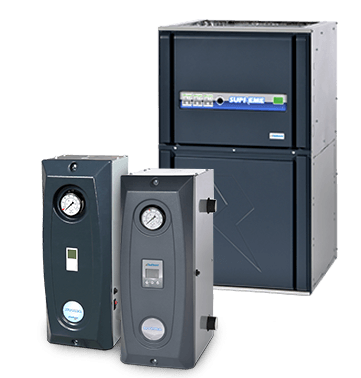 By integrating our Alize variable speed outdoor condensing unit with our Chinook modulating gas furnace and their proprietary communicating thermostat, we have developed the Right-Sized System which is exclusive to Dettson. The Right-Sized System® will provide homeowners with unequalled comfort that until now has not been available to them. Dettson is the first manufacturer in North America to offer the Right-Sized System® designed for today’s tighter, well insulated and more energy efficient homes. High performance homes require a central system with longer operation cycle times rather than the short cycling typical of most HVAC equipment. The new building codes coupling with volunteer programs such as Energy Star, HERS, R2000 and LEED result in energy efficient homes that allow much less heat loss during winter and less heat gain during summer. By working with builders and third party labs, Dettson developed the Right-Sized System which offers less indoor temperature variation and greater humidity control. Because the central system is designed for longer run times with lower airflows it is also much quieter than typical systems. The ECM motor and low fan speed results in a very quiet unit when functioning: 49dB for 1 ton unit, 56dB for 2 tons. The outdoor unit footprint is decreased by the “side discharge” design of the condenser. Our cooling unit Alizé can also be combined to our new modulating platform Supreme from our electric furnaces offer, which allows the Right Sized System also.